-----How do two, seemingly normal, people become wandering nomads? Even more strange, how do they do their wandering by living aboard a 22' C-Dory power boat? -----Authors make much of the passages of life - you know - like high school graduation, getting married, retirement. But, there's a passage apparently ignored by psychologists, and it caught us by surprise. Something snapped when the last kid left home. -----We looked at each other and bingo! Our minds raced along with possibilities - we suddenly had no obligations except to each other. Oh, I know, that's not true - you are always a parent, and there's thhe job, the mortgage, the bills to pay… We sat on the floor, bottle of wine between us, and stared at each other in sudden amazement - it was not the realities but the possibilities that floored us. Suddenly, and prophetically, we understood what sailors meant by a sea change. -----Moments of great insight and moments of insanity must be difficult to differentiate. We were dazed by what might be. Why, if we wished, we could shuck off responsibility as easily as a caterpillar becomes a butterfly. All it required was imagination, guts (or is that stupidity? ), and a touch of insanity. -----El smiled, and took a sip of wine. "Yes, we'll always be parents, but the kids are well-launched and have solid keels." -----"But, honey, the jobs?" I was trying to hold on to a thread of reality. -----"Quit," was the quick response. -----"Sell the house!" El was always the gambler and thrill-seeker in our house. -----"The bills? We have to live somewhere and we still have to eat." I could feel my fingers losing their grip on practicality. We were slipping over the edge. -----"Well, let's crunch the numbers and see if it's possible," came the quick reply. -----"We're nuts," was all I could say as I headed to the computer. -----Computers are great at solving problems - particularly those that involve number crunching. Printed out, the results look so authoritative and exact. We forget the uncertainty of the numbers that we put in, since there in front of us is the final answer - in black and white - and definitely deffinitive! -----El and I have always been independent people - you know, marching to our own drummer and all that. Well, our financial advisor was named Mortimer. IBM built him and he sat on a table in our den. Mort, one of the first PC's, was great at answering "If ... then?" financial questions. And that's just what we needed to know. "If we quit, then can we still eat?" -----We plugged in the numbers from our checkbook and yellow sheets and figured out our expenses (the income was easy to calculate, and we swore we could hear Mortimer chuckling as he figured out that side of the ledger - as teachers, we earned somewhat less than ball players. In fact, my students earned more as parking valets than I did with my teaching). -----After grinding and clunking for about ten minutes, ol' Mort spit out "Death by Starvation." Everything was outgo, and nothing was income. Without the computer, I could have figured that out in about 2 seconds! -----Therefore, we would have to juggle the numbers a bit - I believe the bean counters call that "creative accounting." We obviously needed more on the income side of the ledger, so we projected total returns from our investments and pushed the "GO" button on Mortimer. This took longer - maybe 15 minutes - and out came a new answer - "Slow Death by Starvation." We were getting closer. -----Into the hopper went the income projections we had just received from Social Security. It wouldn't be much, since during all those years of teaching we were both outside the "safety net," as the government likes to call it, dangling over the precipice of financial ruin. But, we had our forty quarters - parking lot attendant, pinsetter in bowling alley, Christmas tree sales - all those high-paying jobs of thirty years ago. So, back to the IBM cruncher. This didn't take long - since the numbers from Social Security were infinitesimal. Out came another, slightly more encouraging result, "Death by Slow Starvation, Predicted to Occur in four and a half years." But there was an optimistic footnote - "*After Age 62, Slower Death by Starvation." -----We had to get more creative - in went our estimates of pensions. They weren't programmed to pay out until age 65. Since Mort said we wouldn't live that long, we plugged in "take it now." He thought that was reckless and "not financially prudent," but we ignored the flashing warning signs. On the highway of life, we had learned that's often a good idea. You know, a little risk and all that. Of course, this time the hazard was slow starvation. Mort thrundled and fumed with the new numbers and then popped out his vision of the future: "If you eat nothing but rice you'll exist, until your demise at age 59." -----We were desperate. We cut out the non-essentials on the spending side, like clothes, ice cream, and M&M's, but that didn't change the results much - "age 59 and two months." We would have to do some radical surgery. El was right; we'd have to sell our house! -----In a stroke that entry into Mort reduced most of our expenses - mortgage, taxes, insurance, and all the bills associated with telephone, electric, sewage, garbage, water, and maintenance. In short, everything except food. Oh, yes - we needed a place to put our heads, but we'd worry about that later. Now, the income side looked brighter. The sale of house, furnishings, car, clothes - actually, everything we had worked for all our married lives - yielded money. This would go into investments that would yield income! -----Mortimer groaned over this change. It was obvious that he didn't like this homeless alternative - his groans, clunks, and sighs were muchh louder than usual. After about a half hour, with a flickering monitor, he queried, "And Me? Am I Gone Also?" A teardrop splattered on the inside of the screen and we could see that we were really asking too much of him. El and I had a quick consult, and then typed into the program, "No, our good and trusted friend. You will be sent off to college, in Colorado, just like the other kids in the family. You will have a chance to soak up beer, record thesis data, and enjoy a new life style with our son, Brad." -----We pushed the "GO" button again, and the screen lit up with "WOW!" and the computer went back to grinding. We had supper, took a dip in the pool, and watched the evening news before Mort quit making hideous noises. The screen was brightly lit and so, shortly, were we - "Barely (Pun Intended) Possible," it said. -----There are many different ways of being homeless. For most of one year, we carried backpacks and walked fifteen to twenty miles a day - and not just ordinary strolling, mind you, but up and down the Appalachian Mountains. From Georgia to Maine! Walking the Appalachian Trail end to end solved the problem of no house, and no direction in life. We had a tent and the direction was north! -----We lived out of the back of a station wagon for another year kicking around New Zealand and Australia. Oh, the stories we could tell - like that night with a Boomslang - but that's another tale. -----We have lived in Youth Hostels (had to lie a little about our age, and dye our hair) on every continent, except the Antarctic (there we stayed on a boat). Ah, there was that night in a tent in Nepal, with our socks soaked in blood from leeches on our legs and feet - but that's another story. -----Now, remember, I said at the beginning of this tale, that we were teetering off the edge of sanity. There have been many evenings, sitting on the floor with our wine, on the edge of tears, when we thought we had gone over the edge. In our travels, tinges of reality occasionally slipped into our lives - like, someday, we might have to settle down. As a diversion, in our peripatetic wanderings, we'd ask each other, "How about here? - nice weather, good view of the mountains?" Soon, El noticed a pattern in our scrutiny of potential sites to settle. 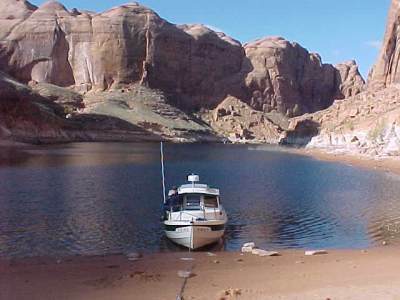 -----"They always have water," she said in a flash of insight. -----I pondered that for a moment, and agreed she was absolutely right - "and usually, lots of water," I added. -----"So, the answer to our housing is obvious," she said, eyes flashing and with that special smile she saves for reckless moments. "Let's buy a boat." -----El has always been a water person. She grew up almost living in her sailing dinghy back in New England. As a kid, she was always tacking and jibing (come to think of it, she's been good at that all her life). When we were first married, and living on the Llano Estacado where a drop of water had a life span of 0.1 nanoseconds, El bought a boat! We hauled that boat 60 miles (one way) with our VW to find enough water to float her, but El was ecstatic. Now, three kids and several boats later, she could sense the ultimate boating experience - living aboard! -----Now you can't live on any old boat. Maybe you can fish, or poke around weekends on an old tub, but to live aboard there are a few necessary amenities. El ticked them off, "A place to sleep, a place to cook and maybe a good place to read a book." -----"How about a sound hull and a good engine?" I added. Remember, El is the risk-taker in our duo. -----"Sure, that too," she said, like it was an afterthought. "Let's look." -----"We need the smallest boat we can live on," I suggested, knowing Mortimer II, the new laptop computer investment advisor, would refuse anything much bigger than a rubber ducky. -----" …And also trailer," El added. "We're nomads. We'll want to explore the three coasts and everything in between." -----My mind had barely grasped three coasts, let alone everything in between, when El said, "So, what are we waiting for?" -----We scanned the Internet, the marinas, and the bookstores. The search quickly narrowed. There are many big, BIG boats to live aboard. Some have sails, some have motors, and some have both. There are, however, very few small boats one can live aboard - and trailer. -----Now, El is the water person, so for years, every time we were near water, she was always "kicking" boats, like guys kick tires. She had spotted C-Dorys and liked what she saw. We had a day trip out of Sitka ,in December, looking for sea birds, on a C-Dory and it was warm and comfortable. El knew the Dory hull - the fisherman off Rhode Island swore by them. "Let's check it out," she concluded. -----We went to Kent, Washington, and checked them out. In five minutes, we had the answer. "That's it," El said. -----"The hull is bombproof and the Hondas are quiet and reliable," I was still pondering. -----"She's perfect," El was confident. "Comfy V-berth, great stove, and it even converts to a heater. Plenty of room for storage. Dory design. Perfect." -----"Let's give it a sea trial," I ventured, being the conservative one. 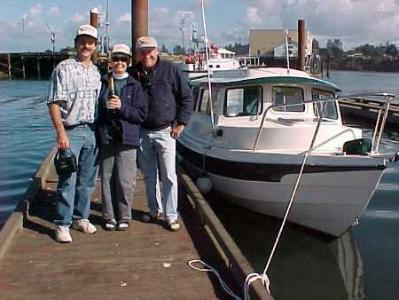 -----The next day, we were in Oregon on the water in a C-Dory. "We have a home," concluded El. -----We ordered a boat and had a month to wait for delivery. "You're lucky," said Harry Andrews, of Coos Bay Marine. "It's usually many months." -----So, we went to Africa with our son, the ornithologist, to chase birds through the marshes of Botswana and Zimbabwe. We also walked into a pride of lions, but that's another story. -----"What will we name her?" El queried. -----"Tough question, hon. Let's ponder." -----So ponder we did, and we came up with Halcyon. The mythical bird of olden times. She built her floating nest at sea, thought the ancients. She had to know when there would be weeks of calm or perhaps she had the ability to calm the seas. "Halcyon it is," said El. "Hopefully, our 'nest' will float on calm seas." -----"Hopefully," I underlined, being the worrywart in our duo. 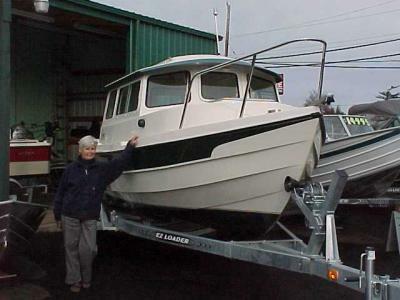 -----We drove to Coos Bay with barely disguised excitement - the addition of a house, a car, a kid - or a boat - is an exciting time for a couple. We parked the truck, walked around the corner of the shed, and there she was - our new lifestyle. -----"You need a windlass, Dad. It's less expensive then a chiropractor." -----"Mom's right, Pop, you need to enclose the cockpit. A bimini won't give you enough weather protection, and with enclosure, you have another room for guests." -----He had to see Halcyon. On launch day, he flew into Coos Bay, with a bottle of champagne.